PastaQueen continues her quest to review every yogurt in the world. Disclosure: I was sent samples of the Yoplait Greek Yogurt to review for this post. Yogurt has become completely confusing. I remember the intimidation I felt when I first approached the dairy case over five years ago, trying to determine which type of yogurt was for me. There are a bazillion brands, and each brand offers a zillion varieties. Low fat! Non fat! Whipped! High fiber! And now Greek yogurt is popping up everywhere to confuse me even more. I need a yogurtoligist to explain all this to me. When I was in London last year, I noticed that lots of shops offered Greek yogurt in their grab-it-and-go cases. I suppose the trend is catching on in America because now Dannon and Yoplait have launched Greek yogurt products. I am somewhat confused as to what qualifies a yogurt to be called “Greek.” It doesn’t have to actually come from Greece. I thought it just needed to be strained, making the yogurt thicker than other varieties. But I’ve also heard that you need to start the process with a particular type of milk, like ewe’s milk or goat’s milk, which have different milk fat percentages. Feel free to sort this out on your own. It’s all Greek to me. Yoplait sent me some free samples of their Greek yogurt, which comes in four flavors: Strawberry, Blueberry, Honey Vanilla, and Plain. This is the fourth brand of yogurt I’ve reviewed on this blog, and I’m beginning to run out of things to say about the creamy substance. 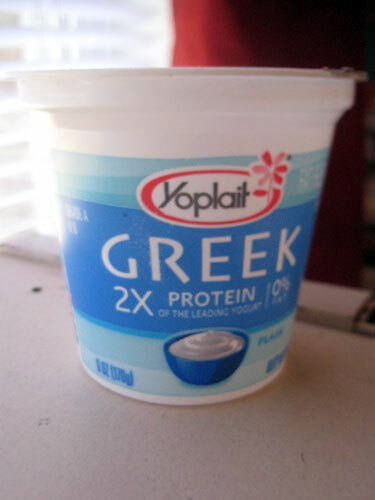 I thought the Yoplait Greek tasted fairly good, not that different from the Voskos or the Stoneyfield Farm varieties. It’s thicker than most other yogurts and it isn’t overtly sweet. The plain flavor was a bit too plain for my sweet tooth, so I mixed in some sweetener which made it more palatable. I looked at the ingredient list and was happy to see I could pronounce all the ingredients on the label. I used to eat the Yoplait Light yogurt all the time because it was by far the most delicious of yogurts. Then one day I ruined it all by looking at the ingredients and saw that they used high fructose corn syrup to achieve that taste. If they’re adding sugar to the yogurt, it’s usually not a good sign for the health-conscious. So, the Greek yogurt seems like a better choice than the Yoplait Light. You can check the labels to see if the 12g-14g of protein is better or worse than your current brand. You can also use this coupon to save $0.30 on Yoplait Greek Yogurt. Good luck in the yogurt aisle! You’re going to need it. Later: PastaQueen meets Jared, The Subway Guy, in a wacky weight-loss crossover! I saw these yesterday when I was studying the yogurt aisle. The 9grams of sugar was too much for me, though. The best yogurt I have found is at Krogers it’s one of their generics, it’s called carb master or something to that effect. Cheap, high in protein, low carb! 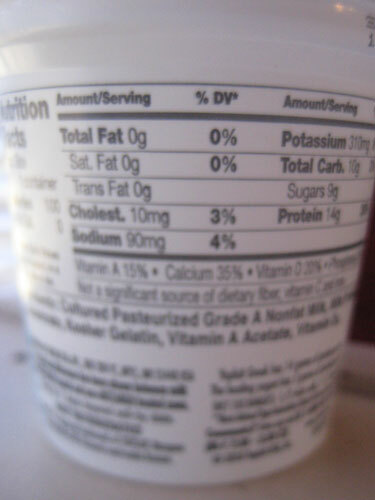 I’m straining my eyes to see how many calories are in this yogurt – can you let us know? Thanks! when i tried the yoplait greek it just didn’t do it for me. i much prefer the oikinos. the yoplait didn’t seem as thick or creamy. of course i can’t enjoy the affordable greek yogurt, just the expensive stuff. grr. Fage Yogurt (pronounced “Fa-yeh” according to the back of the yogurt). @Poppy K – According to their site, the flavored varieties have 130 calories and the plain flavor has 100 calories. Yogurt has become completely confusing. For some reason I find this sentence quite amusing. Do you find dairy products in general befuddling? I agree, Curvy Jones, 9 grams does seem like a lot of sugar for a Greek style yogurt. Have you tried skyr? I eat Siggi’s brand, and I find it to be much healthier and more delicious than the Greek yogurts. Thanks so much for this review! I first saw coupon ads for the Yoplait Greek Yogurt a few weeks ago and had been wondering about it ever since. i tried the Yoplait Greek yogurt recently and I thought it was terrible. It has a strange gritty texture and very little fruit flavor. Personally, I prefer the Dannon Greek version with fruit-on-the bottom. Mmmmm. I agree with Carole and Caroline: Fage = win! and Yoplait Greek = disgusting nastiness. I won’t buy it again. Oikos is ok but not my favorite. Brown Cow is also acceptable but I very much prefer Fage over all others. I’d love to try Skyr but I haven’t seen it in any local stores yet. Regular Stoneyfield Organic reminds me of what yogurt used to taste like. Not sure why but it does. I stopped buying “light” versions of yogurt because of the artificial sweeteners and the chemicals they have to use to get something that tastes nothing like Boston Creme Pie to taste like Boston Creme Pie. I guess I’m not much of a yogurt connoisseur after reading the post as well as the comments. I eat yogurt everyday at lunch and I buy what’s on sale. I always buy the “light” version of what’s on sale so that it will be low in weight watcher points. I’ll definitely look more carefully in the future! @Samantha – Kroger’s CarbMaster is good tasting, but OMG, KILLS my stomach. Fiber in yogurt is not my friend. I confess it’s been eons since I’ve tried Yoplait but my recollection was that it was quite grainy and pretty runny. I always thought that to make the yoghurt “Greek”, it had to be made with higher fat milk. But what do I know? I’m not sure that we can even get “Greek” yoghurt here in Toronto but we CAN get “Balkan style”, which seems suspiciously close in connotation to “Greek”. The Balkan style yoghurt we buy (Astro) is made with 6% milkfat. Of course, you probably completely disagree with me. Because I can’t stand any sugar or flavourings in it. Personally, I prefer it plain plain plain… chacun à son goût. I’m a big fan of the fage 0%. One thing to remember is that, by my understanding, greek yogurt is regular yogurt that has more of the liquid strained out, so it will probably have twice the calories, even if it is fat free. Keep an eye on the label!! @Carole – I agree about Fage. I love the plain, non-fat. I drizzle some agave nectar on it and fold it in (because I can’t eat the traditional honey, sadly) and it’s perfect. If I have some sort of berries on-hand, I add those, too. I also use it as a substitute for sour cream. It rocks. Agree with Samantha about Kroger’s Carb Master – it’s so yummy and the nutritional content is perfect – especially since I do South Beach. I’ve been wanting to “go Greek” – if only for a try, but the sugar content is a turn-off. Having binged on this blog silently from start to finish in the last few weeks, I’m coming out of hiding (I finally got to the current entries). I hear you hate cooking, which is fair enough. However, there’s something you should know about Greek yogurt, which is that you can use it to make some excellent curried chicken. 1 6oz container Fage 0% Greek yogurt. If you want, you can also find the veggie of your choice, chop it, and add it to your chicken roasting pan half way through. For what it’s worth, I’m also doing the weight loss thing, and I have some skill in the kitchen. If, by some strange happenstance, the thousands of comments you’ve already gotten haven’t hit that one “I can do this!” note as far as cooking is concerned, bounce me an email. This may qualify as a legit threadjack, in which case, my apologies. i should add… i love to use greek yogurt in lieu of sour cream when cooking. i use it to make spinach dip instead of sour cream/mayo and i use it on taco salads/burritos/enchiladas etc. where i would normally want a dollop of daisy. Why does it have gelatin in it? Are they scamming people by using less milk then adding gelatin to make it artificially thicker? Great sounding recipe! My fave is oikos, but fage and chobani will do if I’m in a pinch. However, I have a coupon at home and plan on giving the yoplait version a try next time I get to a normal grocery store (I’ve been frequenting the hippie dippie ones that don’t carry yoplait). VOSKOS, VOSKOS, VOSKOS IS THE BEST OUT THERE! They have O% fat too. There are so many to choose from. Personally I don’t like the 0% because it’s not sweet enough, I love the HONEY in the 8oz. I LOVE IT.. If you go to their facebook or website, ask them for a coupon to try it. It seems like they send them to everyone!!!! This is stuff is horrible..it’s fake greek yogurt. Made with Cow’s milk, as it says on the label. Anyway, I bought some plain thinking it would be just like Fage or Brown Cow or Stoneyfield Farms brand. Wrong. Its just disgusting. Don’t waste your money. I thought it had spoiled, that’s how awful this tastes. Unfortunately, I have to throw in another vote for the “It’s horrible!” team. I also eat a lot of Greek yogurt, usually plalin, but sometimes the Fage w/ mix-ins. I made the mistake of trying the Strawberry Yoplait variety and it tasted like pure chemicals. I didn’t even finish it. Also, the texture seemed off to me. FAGE all the way!!! :D Seriously, I have a hard time trying anything else… .. . its THAT good!! But I plan on trying the Dannon and Yoplait anyway, just for kicks..